Just before 7:30 p.m. July 5, 2011, a mile-high, nearly 100-mile-wide dust storm roared through Phoenix, Arizona. AZCentral.com reported that the storm was traveling 50 to 60 miles per hour. At the storm’s peak, visibility varied from a quarter of a mile to nothing, and the storm left behind a path of dust, debris, and muddy swimming pools. Faint remnants of the storm remained the next day when the Moderate Resolution Imaging Spectroradiometer (MODIS) on NASA’s Terra satellite captured this natural-color image. 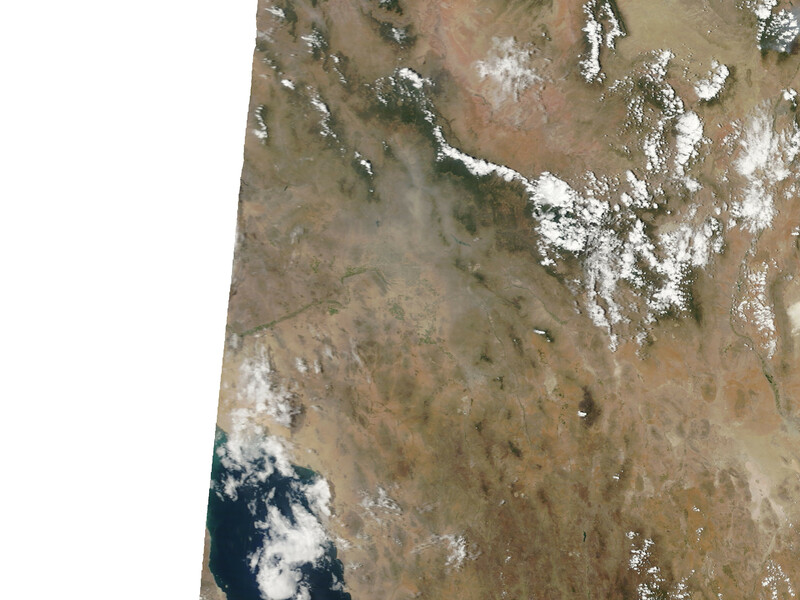 The lingering dust plume appears gray-beige, and the thickest dust is concentrated north-northeast of Phoenix. Meteorologists classify the dust storm that struck Phoenix as a haboob. 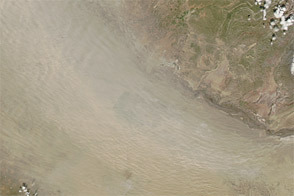 Strong winds blowing downward and outward from thunderstorms stir dust in arid areas. 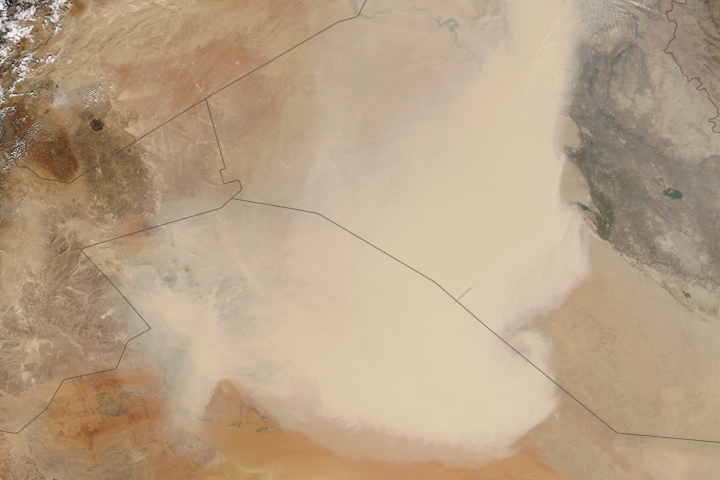 The walls of dust usually envisioned when thinking of severe dust storms are haboobs. 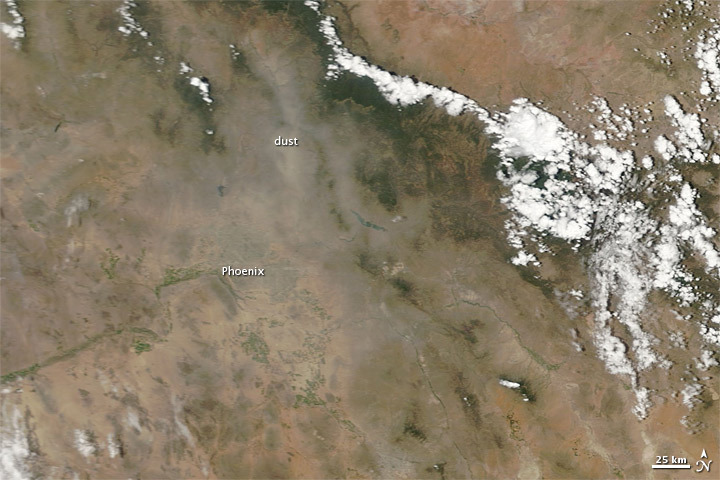 On the evening of July 5, thunderstorms in eastern and southern Arizona collided, and the strong winds and dry conditions combined to raise dust, the Weather Channel reported. A time lapse video shows thunderheads spreading overhead in concurrence with the dust storm. Between 8:00 and 8:45 p.m. July 5, the Phoenix Sky Harbor International Airport shut down, grounding all planes. Some flights were diverted to Tucson or California for landing. The storm also caused power outages throughout the area, AZCentral.com reported. The National Weather Service forecast for the evening of July 6 called for a 20 percent chance of thunderstorms and a 20 to 25 percent chance of more dust storms. Acquired July 6, 2011, this image shows remnants of a powerful dust storm that rolled through Phoenix the previous evening. Associated Press. (2011, July 6). “Mother of all haboobs” dusts Phoenix. The Weather Channel. Accessed July 7, 2011. CNN. (2011, July 6). 70-mile dust cloud rolls into Phoenix. Accessed July 6, 2011. Dolce, C. Where did that weather word come from? The Weather Channel. Accessed July 7, 2011. Smith, B., Radnovich, C., Haldane, M. (2011, July 6). More Phoenix storms forecast after huge evening dust storm. AZCentral.com. Accessed July 6, 2011. University Corporation for Atmospheric Research. Forecasting Dust Storms. (Registration required.) Accessed July 7, 2011. The Weather Channel. (2011, July 6). Time lapse: Amazing Phoenix dust storm. Accessed July 7, 2011.